MONTEREY, California -- For the fifth time, the Monterey Bay Aquarium has placed a young great white shark on exhibit, bringing her from Malibu to Monterey this afternoon (Wednesday, August 26) just 14 days after she was collected by aquarium staff off the southern California coast near Malibu. As with the other white sharks brought to the aquarium since 2004, the aquarium hopes she’ll remain on exhibit for several months, as a way to change public attitudes and promote stronger protection for this magnificent and much-maligned ocean predator. The young shark, a five-foot, three-inch female weighing 79.8 pounds, was brought north on Wednesday in a 3,000-gallon mobile life support transport vehicle. She was collected August 12 by aquarium staff with the help of a spotter plane and a commercial fishing crew using a purse seine net. 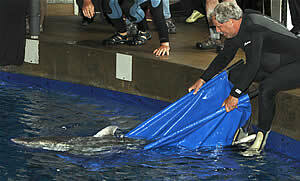 She was quickly transferred to a 4-million-gallon ocean holding pen off Malibu, where she remained for almost two weeks. Aquarium staff observed her swimming comfortably and feeding in the pen nearly a dozen times before she was brought to Monterey and placed in the million-gallon Outer Bay exhibit. An additional four young white sharks were tagged and released in the field this summer as part of the aquarium’s ongoing Juvenile White Shark Project. Since 2002, the aquarium and its partners have collected DNA samples, tagged and tracked 26 young sharks in the wild, and – on five occasions – brought a white shark to Monterey for exhibit. All four sharks previously kept at the aquarium were tagged and tracked after their release. The latest, released near Santa Barbara in September 2008 after 11 days at the aquarium, remained in waters near the Channel Islands off Santa Barbara. Data from her tag, and observations from a fisherman who later accidentally caught and released her, showed she was doing well. In 2004, the first female white shark exhibited in Monterey became “the most powerful emissary for ocean conservation in our history,” according to aquarium Executive Director Julie Packard. The shark was part of the aquarium’s Outer Bay exhibit for six and a half months and was seen by more than a million people between September 15, 2004 and March 30, 2005. In follow-up surveys, visitors reported coming away with a deeper understanding of the need to protect white sharks and their ocean homes as a result of seeing the shark on exhibit. Collectively, the four sharks exhibited at the aquarium have been seen by more than two million people. Since 2002, the aquarium has allocated more than $1 million toward field studies of adult and juvenile white sharks – research unrelated to the effort to put a white shark on exhibit. Data from tracking tags placed on adult and juvenile white sharks are providing new insights into their far-ranging travels in the eastern Pacific, according to Dr. Barbara Block of Stanford University, a marine biologist and principal with the Tagging of Pacific Predators (TOPP) – one of the aquarium’s key research partners. Real-time tag data and published research can be found at www.topp.org. Before bringing a white shark to Monterey, members of the aquarium’s field team monitor its behavior to see if it has adjusted to swimming in an enclosed space. The team offers salmon, mackerel and other fish, and confirms that the shark is feeding consistently before bringing it to Monterey. 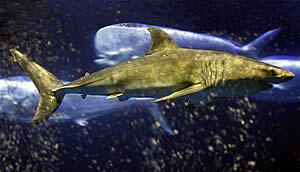 The aquarium’s million-gallon Outer Bay exhibit was designed for pelagic (open ocean) animals like white sharks. It is home to Galapagos and scalloped hammerhead sharks, as well as large bluefin and yellowfin tuna, barracuda, and other species. devoted to the white shark project; and through exhibit graphics that address the threats facing white sharks. "I can't overstate the impact this single animal" has on the Aquarium's budget. There's no research on whether there is any long term harm by taking an open-ocean animal and caging during the first several months of its' development. As hard as it is to study a White Shark in the wild I think this a great oppurtunity. Nowhere else in the world has been able to keep a white shark in captivity for so long.